Home » brands » marketing » social media » With Twitter now positioned as a News App – and not a Social platform – how should brands react? Twitter has switched its position from social network to 'News' on the App Store. While most of us can understand the new position – micro-blogging platform Twitter will no longer fight for pole position with the likes of Facebook on the Apple App Store. Twitter is well known for real time news feeds and events and unlike Facebook, it is preferred less when it comes to keeping in touch with friends. The move makes sense. It is a change that makes a lot of sense and fits with both how Twitter has positioned itself as well as how it is being used,” the technology website Endgadget reported. Does this new categorization mean a lot to the end-user? No. But it does tell us about where Twitter is headed – and in some ways where social networks are headed. Twitter hasn't been doing well, financials and growth has been dismal. This move it will likely help it get more visibility and therefore downloads, it hopes. Twitter might be able to shift the focus onto its role in news gathering and breaking. Endgadget says "Watching news and events unfold in real time is arguably the platform's best feature – it's less about keeping in touch with friends and more about following people who share things you find interesting and relevant, whether you know them or not. Twitter Moments was probably the biggest new feature the service launched in the last year, and it again shows its focus squarely on curating the best commentary surrounding current events." The move also puts Twitter’s app in front of a different sort of audience – those who are looking for easier ways to keep up with news on their mobile device, rather than those who want to use another social network. Brand strategy for engagement on twitter hasn't changed much, and the fundamentals still apply. If there's going to be a shift in Twitter's target audience to news hunters and trend seekers, brands naturally need to adapt quickly. 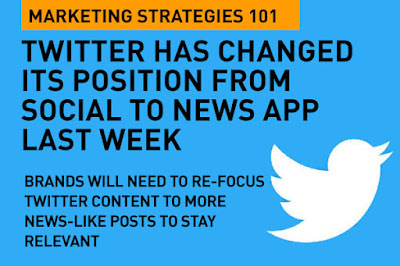 Brand tweets need to be a lot more in the here and now – with their content focused on being newsworthy and on trend. Product launches, new features announcements, and special events will be better received – but simple brand tweets that are re-purposed from Facebook posts are not going to resonate. 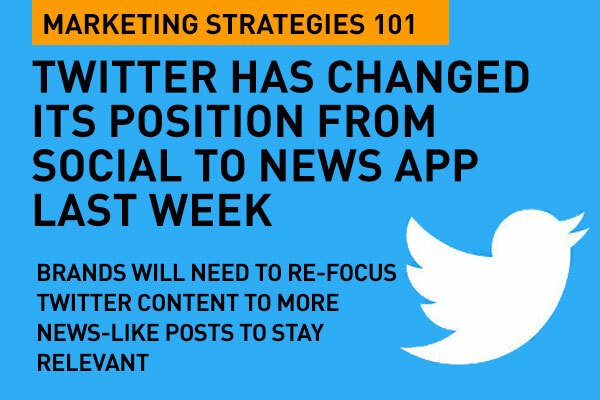 Brands must remember to tailor their twitter content in the right context – to cater to the state-of-mind that the audience would be on the newly, re-positioned platform. Here are three simple ways to improve twitter content for brands. Brand content on twitter needs to be immediately shareable. Brands can (and will) continue to use twitter for customer service because it provides a sense of immediacy. But 'breaking news' will now probably take prime position. Curating and sharing other people's content that's wrapped around current and trending content – related to the brand and product in some way, ideally, will be really useful as a brand tweet strategy. Quality of content needs to be top notch, naturally, and consistency and frequency will now become crucial. The only way to be able to curate and build relevancy on twitter will be to listen to what's happening around you. No matter what position Twitter takes on the App Store, brands need to remember the power of dialogue and interaction. Twitter has never been about selling, it has always been about building a following and interacting, and nothing will really change that. To really deliver meaningful content, one needs to keep track of audience intent. That's the basics of any brand strategy. That's digital marketing strategies 101. Twitter's new position is a gimmick. A clever way to top the charts on the App Store! This is not a gimmick, as some of the comments say. I think that twitter is repositioning itself because it really is a news based platform today. Twitter is a discovery channel rather than a sharing with friends network. This is appropriate, and it will also help separate it from the crowd of social sharing platforms. "Really useful stuff .Never had an idea about this, will look for more of such informative posts from your side.. Good job...Keep it up"! !